Motorcycles are a desirable form of transportation for a lot of drivers in New Jersey. These vehicles are a lot less expensive than most cars on the road and substantially more economically efficient, especially when it comes to traveling through cities. Unfortunately, those on motorcycles are at an increased risk of suffering serious injuries, should they be involved in an accident. Motorcyclists’ bodies are almost completely exposed to oncoming vehicles, rendering them helpless against larger vehicles on the road. Motorcyclists understand the vulnerable condition they are in on the roadways, which is why they are so cautious while hitting the roadways. Unfortunately, they are unable to eliminate the risk of becoming involved in an accident caused by a reckless driver sharing the road. Individuals who are involved in motorcycle accidents often suffer devastating, long-term impacts because of their injuries. Motorcyclist injuries are often life-threatening or result in death. If you or someone you love have been injured in a motorcycle accident, or your loved one died, due to a negligent driver, it is crucial for you to contact a motorcycle accident attorney at Brady, Brady & Reilly, LLC as soon as possible to discuss your motorcycle accident. In New Jersey, motorcycle accidents can happen at any time. There are various reasons these incidents occur. Speeding Drivers: Cars and trucks traveling down the road often rear-end motorcyclists after failing to recognize how fast they are going. Motorists often assume motorcyclists are speeding, which is a rather deadly assumption. Driving Too Slow: Drivers who fail to maintain the flow of traffic can cause motorcyclists to crash their vehicles. Negligent Drivers: Merging into other lanes without looking and turning in front of motorcyclists in intersections are leading causes for motorcycle accidents in New Jersey. Poorly Maintained Roadways: Unlike cars, motorcycles have a difficult time maneuvering over poor road conditions because they balance on two wheels. Potholes, uneven surfaces, debris, and other objects in the roadway can cause motorcyclists to lose control of their vehicles. Product Liability: Motorcycles with defective parts or defective designs place drivers at an increased risk of being involved in an accident. If you or a loved one are injured on your motorcycle due to any of these contributing factors, contact Brady, Brady & Reilly, LLC as soon as possible to schedule a free case evaluation and find out if you have the right to pursue legal action. Dangers in the roadway place motorcyclists at an increased risk of sustaining injuries if they become involved in an accident. The attorneys at Brady, Brady & Reilly, LLC understand the unique challenges motorcyclists face while trying to maneuver around on our busy roadways. Although motorcyclists often go above and beyond to ensure their safety, and the safety of others, on the road, they are often blamed for causing accidents. Some drivers even blame motorcyclists for accidents because they were driving in dark conditions. The truth is, most motorcycle accidents occur in the day time. Driving Conditions: It is difficult for individuals on motorcycles to anticipate disturbances in the roadways. Passing over branches, leaves, potholes, and other hazards in the road can be extremely dangerous for motorcyclists. Inclement Weather: Weather conditions can change suddenly and have a devastating impact on drivers’ ability to see objects in the roadways. Motorcyclists who are caught in the wind, fog, rain, ice, and snow are difficult to see, which increases the likelihood of an accident. Uneven And Damaged Roadways: Roads that a riddled with broken or rough patches, ruts, bumps, or potholes can throw motorcyclists off balance and cause major accidents. These conditions are often unpredictable, as motorcyclists are unable to notice them from a distance. If they try to swerve to miss the damaged areas or brake, they are more likely to be struck by other vehicles from behind. Poor Traction: Oil, water, and gravel can put the lives of motorcyclists’ at serious risk. These elements can create slick finishes, which makes gaining adequate traction extremely difficult for motorcycles. 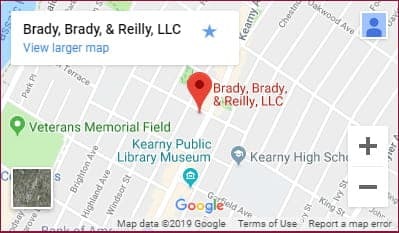 Working with a reputable and experienced motorcycle accident attorney at Brady, Brady & Reilly, LLC will ensure you are able to obtain a full and fair amount of compensation for your injuries. Victims are able to receive compensation for all financial damages incurred as the result of the accident. Additionally, victims are able to be compensated for punitive damages in some cases. These awards are given to victims who suffer due to gross negligence. It is crucial to contact a skilled motorcycle attorney as soon as possible to ensure you are compensated for injuries and damages caused by a reckless party. Being involved in a motorcycle accident can be terrifying and life-changing. Accident victims are often forced to undergo extensive medical treatments and spend lengthy periods off work. Lost wages, combined with ongoing medical expenses, can financially devastate a victim. If you were injured in a motorcycle accident in New Jersey, you may be entitled to reimbursement for your injuries and damages. The attorneys at Brady, Brady & Reilly, LLC understand the challenges injured motorcyclist face in the aftermath of their accidents. These individuals often suffer serious injuries, which can drastically impact their ability to return to activities they love. With over 50 years of experience, the lawyers at Brady, Brady & Reilly, LLC work diligently to ensure motorcyclists obtain full and fair compensation for their injuries and damages. We will work with you to determine the best legal approach for your case. Contact our law firm today at (201) 997-0030 to schedule a free case evaluation.